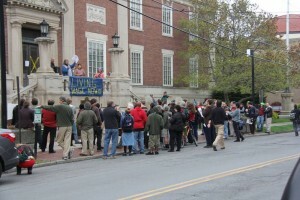 Over 100 people attended a Rally on May Day 2012 at the Tompkins County Courthouse to support a Tompkins County Resolution that would increase the statewide Minimum Wage to a Living Wage. While the Workers’ Center Resolution that would increase to a Living Wage was defeated by a 6-9 vote, a Resolution to increase the Wage to $10.39/hour was approved by a 10-5 vote ($10.39 would be our Minimum Wage if wages had kept pace with inflation since 1972). « Three Tompkins County Businesses Newly Living Wage-Certified	» Make Minimum Wage a Living Wage! Yardsigns Now Available from the Workers’ Center! Will Send Anywhere!